This week we will be looking at consuming API&apos;s and utilizing APIs to fetch reusable data. The challenge is basically to build a movie trailer player with image thumbnails for a playlist and a section to display selected video. The final product should look like this, howevever feel free to try out any awesome tweaks. The goal is to diplay a list of movies with their thumbnails and play a trailer once it&apos;s movie thumbnail is clicked. This challenge can be solved using any method, tools and frameworks. An API containing movie titles, poster image URL and trailer URL is provided in the base codepen. Have a section for movies and a section to display selected movie. Once a movie thumbnail is selected, display the corresponding trailer. Just to have more fun, you can display the name and year of release of each movie as a text overlay on the thumbnails. 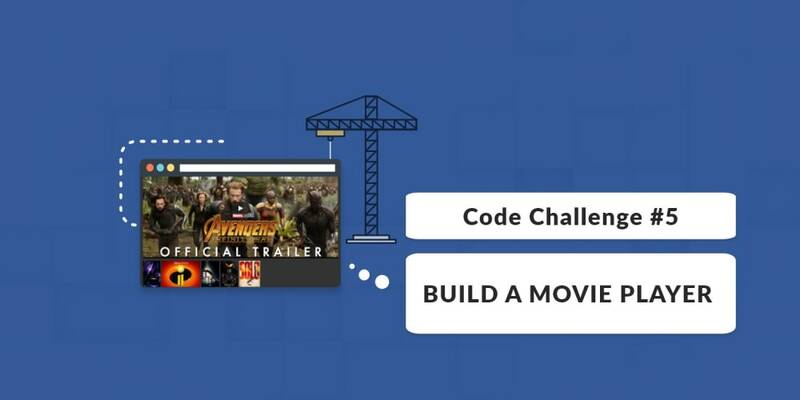 Check out the base code for this challenge including an API containing movie titles and basic information on the movies. Fork the base codepen here as your starting point. Join the Slack group to interact with others and share ideas on the Slack Channel #codechallenge. Post your solution on twitter using the hashtag #scotchchallenge. The solution to this challenge will be released on Friday. Happy coding!